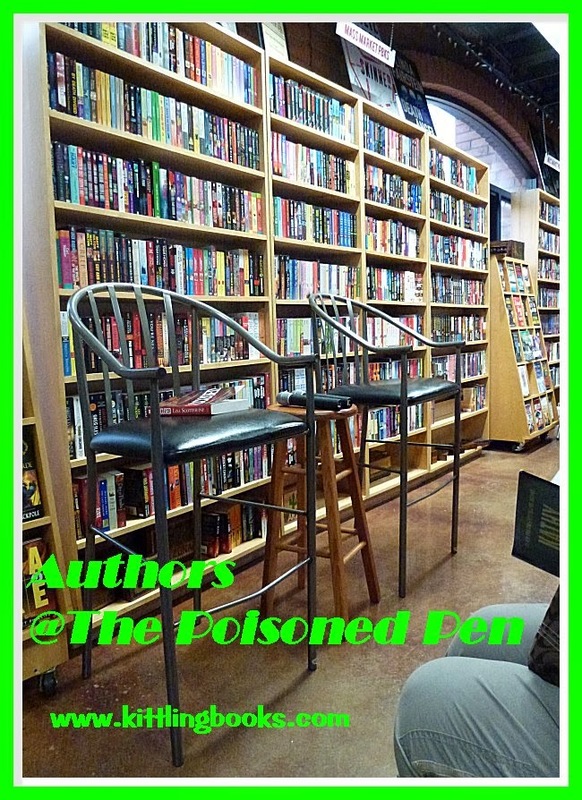 @ The Poisoned Pen with Laurie R. King! One day this past summer, I sat in the pool and almost forgot to get out. Why? I'd fallen headfirst down the rabbit hole created by Laurie R. King in her book, The Beekeeper's Apprentice. 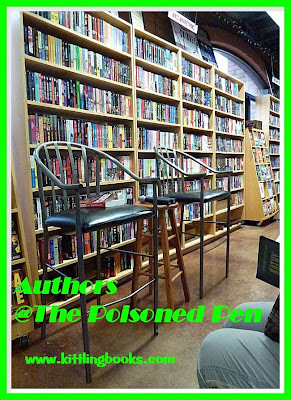 Since it now ranks as one of my best reads this year, what do you think I did when I learned that King was going to appear at my favorite bookstore, The Poisoned Pen? The first person who said that I immediately marked that date on the calendar wins the prize. The day arrived, and Denis and I were ensconced in our chosen seats when-- wonder of wonders-- another favorite author of mine, Betty Webb, sat down next to Denis. We had a nice little chat about Facebook and Iceland, and when Betty learned a bit about Denis's background, she laughed and said, "I have to tell my husband I met a Cod Wars veteran!" The event kicked off with a short talk from a member of the Maricopa County branch of the Women's Philanthropy Circle, an organization whose aim is bettering the lives of women through education. Anyone who donated to the organization was eligible to win prizes in a drawing that would be held after the author event. 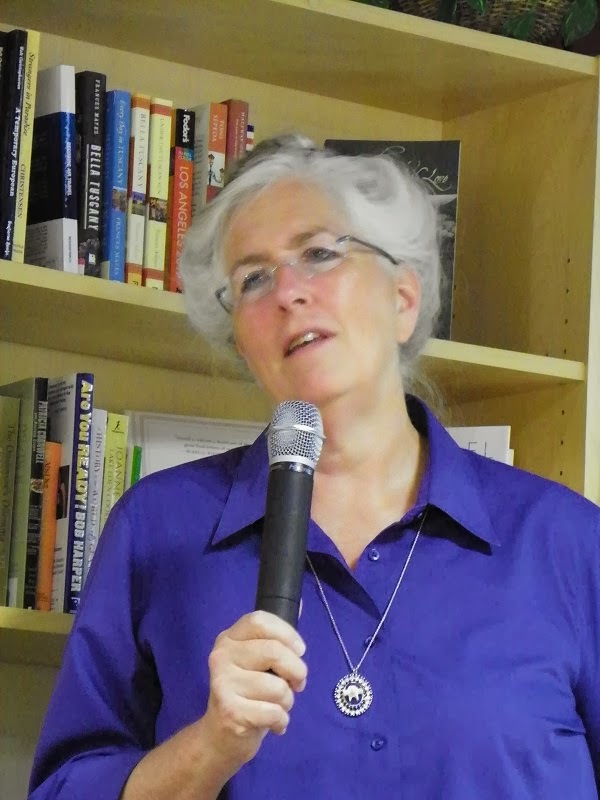 Host Barbara Peters introduced Laurie R. King as "a friend, colleague, travel companion, and co-author." Next year, the two women will be co-authoring The Noble Throne, a journey through Japanese plumbing, and they gave just enough teasers to make me want to buy a copy of the book when it's published. Touchstone, the first book featuring Harris Stuyvesant and Bennett Grey, was originally planned as a standalone novel. It is King's response to 9/11. She wanted to know "what makes people become terrorists?" In the book's first draft, pretty much everyone died, which was why Touchstone was thought to be a standalone. But through subsequent rewrites, King realized that she had enough material and ideas for other books. Her Mary Russell and Sherlock Holmes books are "basically whimsical conceits." King has found that the world in the 1920s (in which her Russell and Stuyvesant books take place) contain a number of parallels to where we are today. Needless to say, she loves exploring these similarities. In the 1920s, it was greatly feared that England was going to become Communist. The Russian economy, what happened to the tsar and his family... all these things and many more were seriously considered to be threats. 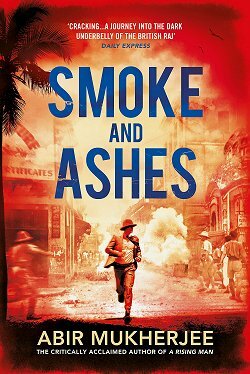 It was a place King couldn't go with Mary Russell and Sherlock Holmes-- mainly because that series is too slow moving-- so the author started with a new character, an American searching for terrorists. This is a wonderful period of art and literature, but The Bones of Paris also explores crime and failure... the dark side of the City of Light while Harris Stuyvesant trolls the cafés and bars of Montparnasse looking for a missing girl. One of the things King enjoyed doing as she wrote the book was playing around with the expectations and outsider knowledge of her readers. The book takes place in 1929, and she knew that no one needed to be told that the Crash is coming. As she did her research and as the book slowly began to come together, Laurie realized what a fun setting she'd chosen for her book. Although the Catacombs of Paris do figure in the book, King has not visited them. 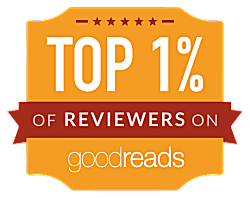 "I don't do well in tight places, and I thought readers would allow my research to suffice." There used to be hundreds of kilometers of quarries in the Paris area. In the late eighteenth century, many sections of these quarries began to collapse-- which was not popular with the citizenry. One of the Paris cemeteries was well above road level and could not shore up the weak places in the walls. Bones from the cemetery (in use for at least 1,000 years) were used to raise the road levels. The old cemetery is now a marketplace, and-- as humans have been known to do-- the local people started arranging the bones into decorative walls of skulls, etc. I wouldn't mind checking the catacombs out myself... except that I don't do well in tight places either, and I don't do underground! 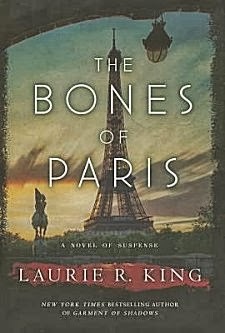 Laurie R. King really likes Pinterest and created a board for The Bones of Paris. Backed by Random House, there was also a contest in which participants were asked to create Pinterest boards about Paris in 1929. King was the judge, and was thrilled at the creativity and attention to detail of the contestants. The lucky winner received an iPad loaded with all of Laurie R. King's books. There's also an interactive map of Paris on the author's website. When asked about the future of this "series" featuring Harris Stuyvesant, King is uncertain. "I'm not given blank checks to write what I want," she said. She talked about images of various places of interest in Europe between the wars, which is when Barbara Peters told us that she's rooting for King to choose Stockholm or Oslo. King is currently writing her next Mary Russell book. Many faithful fans thought they'd missed a book in the series because of a mention of a trip to Japan. "There is no book [about that trip] because I hadn't been to Japan yet," King said. And as for the Mary Russell book that she's writing, it may be a two-part book, so don't say we didn't warn you! With a bestselling series of books that has Sherlock Holmes as a character, it was inevitable that King be asked what she thought of the recent spate of television series and movies about the world's greatest detective. "Robert Downey, Jr. plays it for laughs," King said. "Elementary is an Americanized version that leaves out a lot of Sherlock Holmes stuff, and the BBC series [Sherlock] with Benedict Cumberbatch is fabulous." Other folks sitting in the audience at The Poisoned Pen wanted to know if there would ever be a television series about Mary Russell. King told us that occasionally a Hollywood agent will tell her that someone has asked to read it. She has very mixed feelings about putting her books on film. "I know authors whose lives have been eaten alive by screenplays," King said. "They have no time to write books." As usual, the evening was over much too soon, but before we left, I had two books for Laurie R. King to sign, and there was one more surprise in store: Denis won one of the Women's Philanthropy Circle's prizes! Cathy - Oh, she sounds terrific. And you've reminded me that I must do a spotlight on one of her books. The Poisoned Pen is certainly keeping y'all busy! What did Denis win? 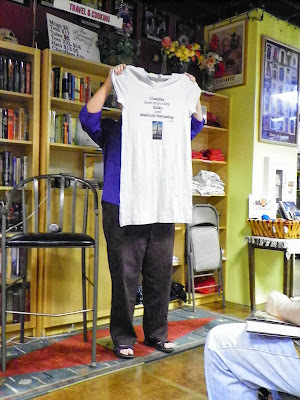 So glad you started going to The Poisoned Pen author events. I'm enjoying them long distance thanks to you. I'm so glad, Barbara. Two things had to come together: the end to a demanding work schedule, and a vehicle high enough to keep me from being blinded by oncoming headlights at night! How interesting to read what she said. A smart woman is she. 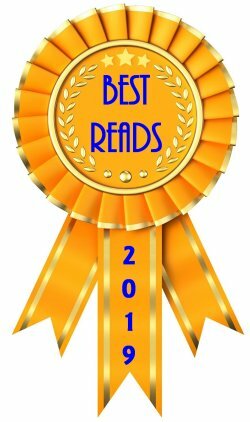 I loved her Kate Martinelli series and still miss it. I must get back and read more about Russell and Holmes. 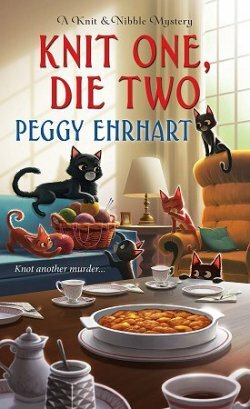 I have yet to sample her Kate Martinelli books, but I will relatively soon, since I think she shares the spotlight with Russell and Holmes in one book.